Wintering Bees Cluster: What's going on? A common question that non beekeepers constantly ask is how bees survive through cold winter temperatures. “They create a cluster and use vibration to keep the cluster warm” is the typical response that usually concludes “they do not hibernate”. As beekeepers, do we truly understand what is happening within that cluster? We understand that the bees generate metabolic heat, but how? Honey bees would not have a chance if they did not function as a highly organized superorganism that worked efficiently. Each bee fills a need within the colony and this assigned division of labor allows honey bees to be successful. To maintain heat within the cluster the colony mush be able to produce heat and use bees to insulate and reduce heat loss. The bees on the outer edges of the cluster act as insulators and will rotate into the center where the temperature is warmest. The “heater bees”, as discovered by Professor Jurgen Tautz at the Wurzburg University, in Germany, are responsible for maintaining the temperature of the brood nest. Fondant is a great feed when your bees are clustered. Thermal imaging has revealed that heater bees will decouple their wings so the muscles can move at full speed without moving their wings. This movement will increase their body temperature to the point where they should cook themselves, up to 111 Fahrenheit, but are able to withstand. Further investigation revealed that the heater bees would position themselves in empty cells amongst the brood in order to sustain temperature in the surrounding cells. These bees will even place their thorax on cells to increase the temperature within by a few degrees. The point to be mindful of is that the cluster stays warm, the hive does not. Bees make no attempt to maintain heat throughout the entire hive. A hive that is uniformly warm would not require a cluster to form around the brood. Warmth is essential for maintaining brood health and bee movement. Beekeepers are able to help the colony maintain cluster temperature by removing unnecessary dead air space. Condense the hive down to manageable setup and reposition the food stores for easy access. Insulators are great to trap heat but will also trap in moisture. Choose a material that is absorbent or allows for moisture to escape. Use windbreaks to prevent gusts of wind penetrating the hive. 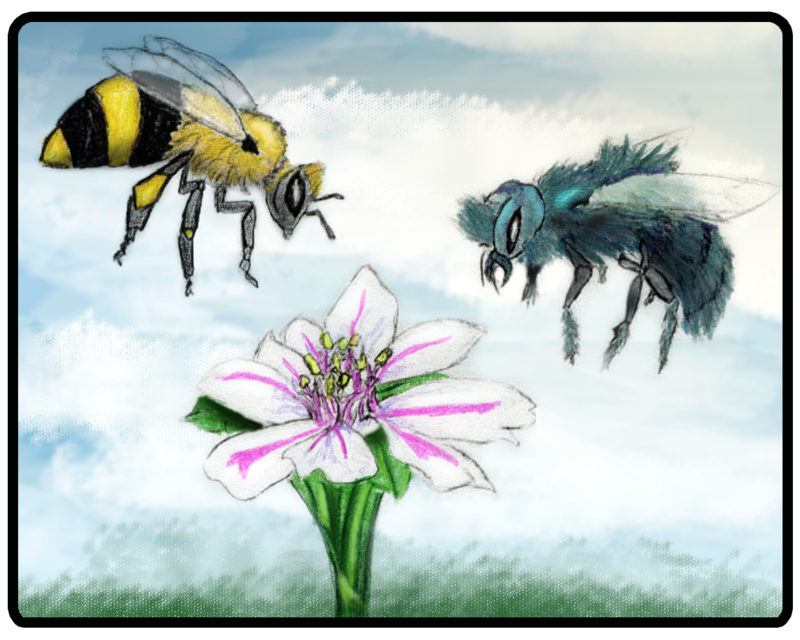 What Makes Winter Honey Bee's so Special? Have you ever wondered why winter bees live longer? Next question; what is Vitellogenin? Vitellogenin is classified as a glycolipoprotein as it has properties of sugar, fat and protein. The honey bee colony's health is dependent upon the buildup of this protein reserve as it acts as an antioxidant to prolong the Queen and forager's lifespan. It is also used to produce royal jelly and is a vital part of the bee's immune system. Additionally, it functions as a hormone that affects future foraging behavior. Within the worker bees, those with the highest levels of Vitellogenin are given the job of nesting bees while those with exhausted reserves become foragers. How does this impact my winter bees? We always recommend feeding bee's sugar syrup with a supplement going into the winter. This is a no-brainer. What we don't touch upon is the protein intake of a colony. The best indicator of adequate protein is the diversity of pollen stores. 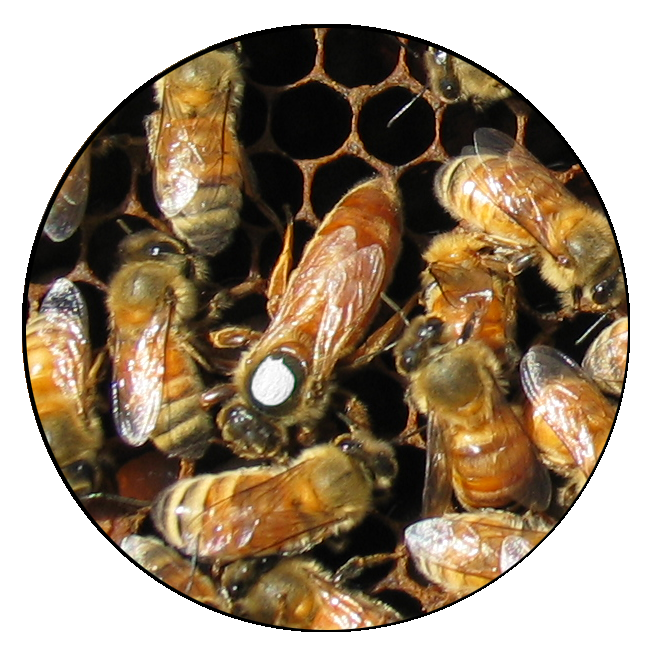 Colonies that are still rearing brood can easily deplete their pollen stores and begin to delve into their Vitellogenin during a pollen dearth. The upcoming winter generation needs to have built up lipids and proteins stored in their fat bodies (nutrients held in the bees body) so that they may survive without honey stores. Keep in mind that high levels of vitellogenin going into winter will help with the pollen shortage in early spring. There are many advantages to feeding syrup and protein sources in the fall. There are several nutritional supplements that can be included in syrup to incorporate the needed nutrients to maintain a healthy colony. 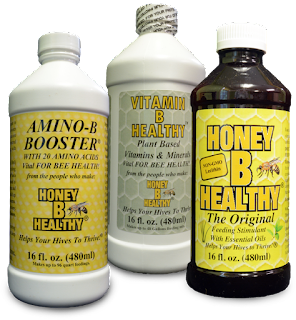 Amino B Booster is a blend of free amino acids that assimilates directly through the mid gut to the bees' hemolymph and hemocytes, then transported to the sites where protein is needed for bee growth. Vitamin B Healthy provides the needed nutrients vital for bee health when pollen sources are scarce or pollen lacks the essential nutrients. Hive Alive strengthens the bees' immune system and helps bees absorb the nutrients, proteins and sugars needed to increase brood production. Beekeepers with negligible fall pollen should look to pollen sources to sustain or build up protein reserves. The best pollen source would be that extracted from the colony or from a reputable local supplier, however, there are other substitutes that will provided the needed protein and lipids. You need to look to sources with protein levels higher than 25% such as our Ener-G-Plus which provides this with approximately 32% crude protein. Save time with the prepared pollen substitute in patty form. Honey bees require protein, carbohydrates, lipids, vitamins, minerals and water. Ensure the emerging generation going into winter has an abundant, nutritional diet so they may pack in their fat bodies for longer months. What is a Resource Hive? Overwintering NUCs: Trying to keep a NUC going over winter to help grow a hive in the spring? The double chamber in the Resource allows you to keep two NUCs in one hive, using heat generated by both hives to help keep the hive temperature stable through the winter. You can even alternate each story with a frame of brood and a frame of stored honey / sugar syrup (checker boarding) to help provide easily accessible food during the winter. Boost Weaker Colonies: Needing to build up a weak colony? Condensing a weak hive down into one half of the Resource Hive allows the colony to concentrate more on rebuilding itself than expanding. Making Spits: With the bottom hive body divided into half, it's never been easier to split a hive. Take the frames from the hive you want to split and divide them on each side of the Resource Hive. Keep note of which side of the resource hive the queen is located and begin to introduce a queen to the other half of the hive. Once the new queen has been successfully introduced to the split you can then relocate both colonies to separate hives to continue their growth. Raising Queens: Seal off the space between the top and bottom story and you now have 4 separate 4-Frame NUC boxes you can use to raise queens. Use the NUC inner cover entrances as entrances for the 2nd story while using the bottom board entrances for the 1st story. Learn more about the Resource Hive and order your own here. Read the 1st part of the blog, covering harvesting honey tips, here. Let's talk about extractors. Extracting your honey frames is exciting but poses many questions. Do I need an extractor? What size extractor should I get? Which is better, hand cranked or powered? There are three main questions you need to ask yourself and the answers will point to the extractor that best fits your needs. How many hives do you intend to have? You do not want to outgrow the extractor. You may have five or ten hives currently but you are expecting to expand your bee yard to thirty hives. By the time you reach your thirty hives you do not want to look back and wish you had gotten the bigger extractor. Let's be realistic, an extractor is a large investment. There are different alternatives if an extractor isn't in your budget. You may be able to borrow/rent an extractor from your local bee association; you can uncap and let the honey drain from the frames; you can strain your comb through cheese cloth; other methods are also available. Extracting is not a ten minute process that will happen in an afternoon. Each extractor will hold an allotted amount of frames. 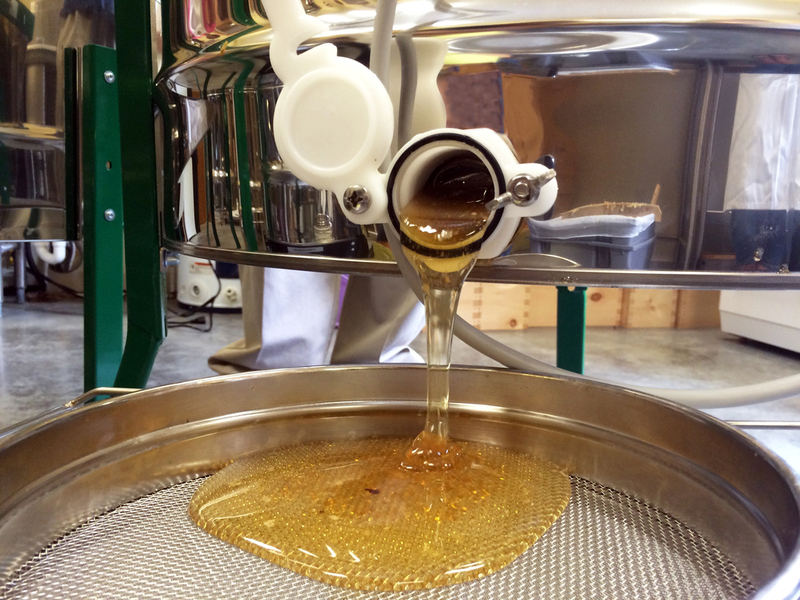 The more frames an extractor will hold the less cycles you will need to run to extract the honey from the frames. Do you have time to run through thirty extractions on a compact extractor or would it be beneficial for you to run six on a 21-frame extractor? We have developed a chart that shows the amount of time needed to extract with each extractor. The time depicted is for running extractor and does not include time needed for uncapping, loading, unloading, and any other actions needed for extracting. 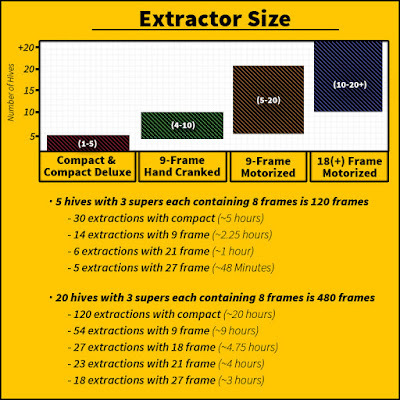 Time consumption for extracting will depend on the extractor being tangential or radial. Tangential extractors seat frames parallel to the center and only extract one side during the spin cycle. Radial extractors seat frames perpendicular to the center and will extract both sides at once. Anticipating the number of hives you will have in the future will help you decide what extractor size will work best for you. For more information about extractors and what models are available, click here. Colonies that survived through winter grown enough in population going into the nectar flow to store an excess amount of honey in late spring/early summer. Those fortunate beekeepers will be able to harvest and extract this sweet reward. 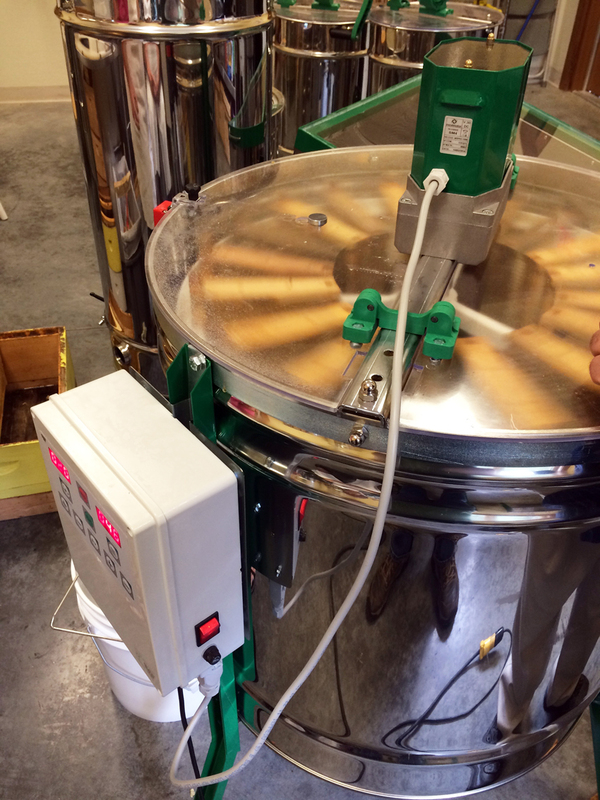 Harvesting and extracting your honey is a multi-step process. Using a bee brush to brush off every frame is time consuming and will leave your bees irritated and ready to sting. An escape screen is placed between the brood chamber and the honey supers. A simplistic concept that has the bees 'escape' from the honey super down into the brood chamber. It does require all upper entrances be closed off. 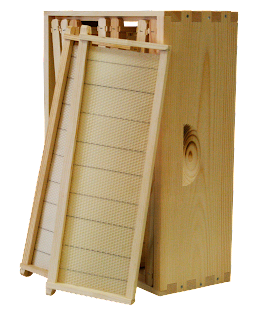 Fumes resonating from the sun baking down on a fume pad drenched in Natural Honey Harvester will quickly force your bees to vacate without contaminating your honey. This is the quickest method to evacuate your honey super. 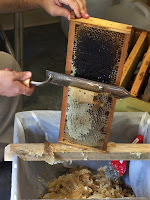 Using a Cappings Scratcher is an easy method to work small sections of capped honey at one time. Slide the forks underneath the comb at a horizontal angle and lift vertically to remove cappings. 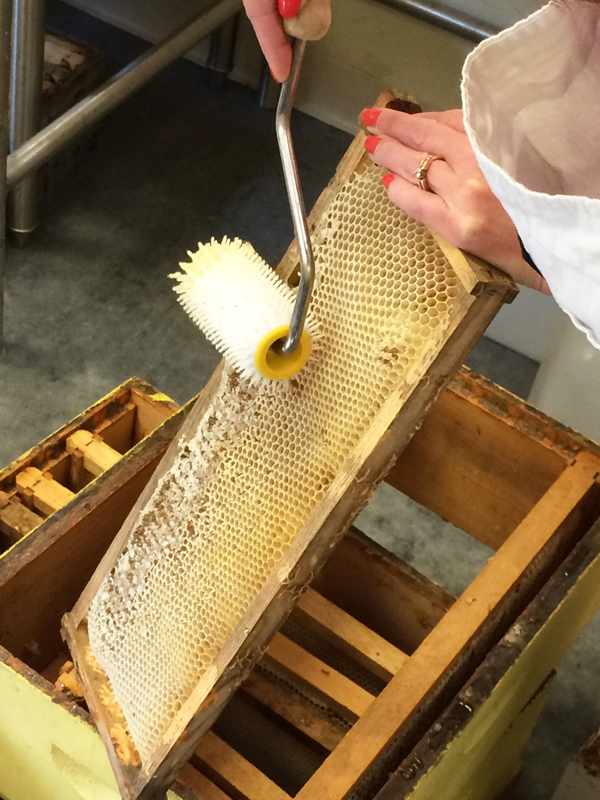 Many beekeepers will scrape the forks against the comb to open the cells. Please note this damages the comb and requires more cleanup from your bees. A Cold / Hot Knife will slice away larger sections of capped honey from the frame. Place at a slight angle along the top and move down the frame in a sawing motion. Be careful not to 'dig' into the comb or tear apart the frame. The Cold Knife has a serrated blade and can stick if not kept clean. The Hot Knife is temperature sensitive and will melt away the wax. Preheat before use. A Cappings Scratcher may be needed for unevenly drawn out sections of the frame. The Rolling Uncapper will roll over the capped honey and pierce the cappings. Allow the cappings to be pierced by pulling or pushing the Rolling Uncapper parallel to the frame. Do not push roller into the frame. Clean the central bar if roller begins to stick when rotating. If time is of importance, the Sideliner Uncapper is a quick and easy method. Run your frames through the roller blades and both sides of your frame will be uncapped. This does not require you to hold the frame and all the debris is caught in the container underneath the sideliner uncapper. 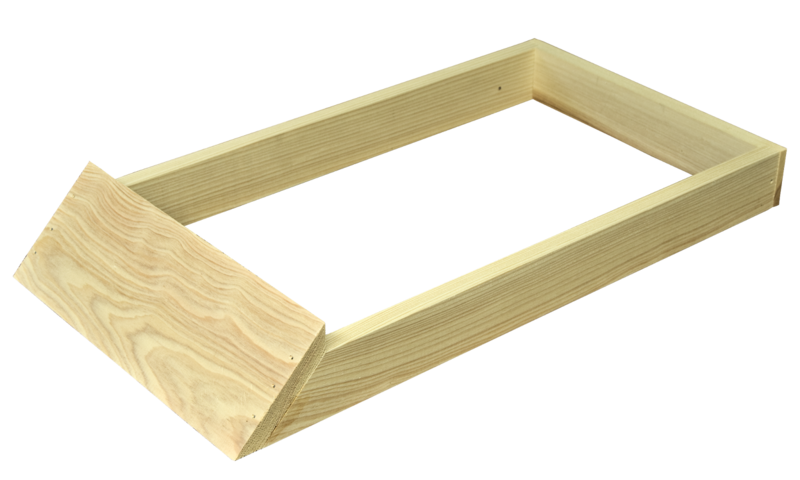 A Cappings Scratcher may be needed for unevenly drawn out sections of the frame. Click here for Part 2 where we talked about trying to figure out what extractor or extracting process would work best for you. What are signs of a productive queen? Finding the queen is a difficult and timely task that is unnecessary. Always check for signs of eggs when inspecting your colony. Eggs indicate a Queen was present within the last 3 days. Eggs, larvae, and capped brood confirm a balanced expanding colony. Healthy Larvae should appear white, plump, and glistening. Discolored and dried up larvae are signs of Chalkbrood or other diseases that should be identified and treated. Brood frames should be full looking with brood of similar age. The queen works from the center to the outside; therefore, eggs and larvae of the same size should be found in different stages, moving from the center of the frame to the outside. 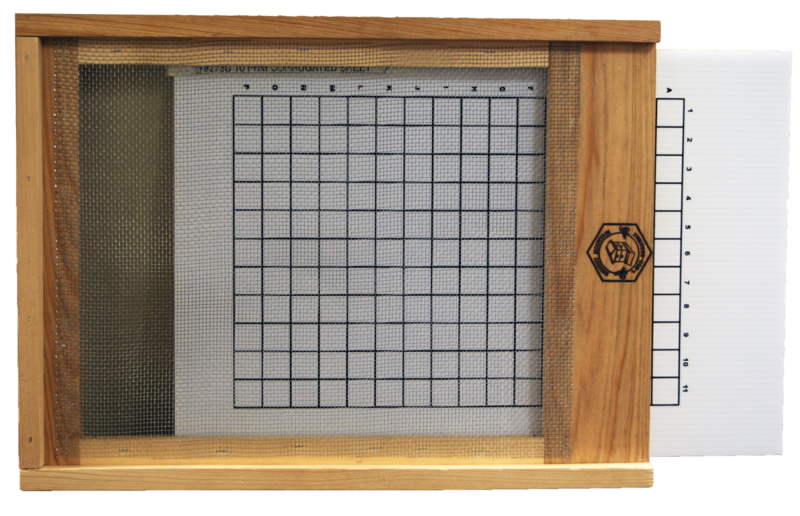 Assess the number of frames that contain brood. Populations will continue to increase with the abundance of resources in the area, will typically remain stagnant during the hot summer months, and begin to wane in the fall with the decline in nectar flow. 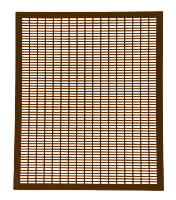 Brood chamber(s) with 5 to 8 frames filled with brood is ideal. Finding multiple eggs per cell is a sure sign of a laying worker. A laying worker will take the role of the queen if the colony is queenless for an extended period of time. 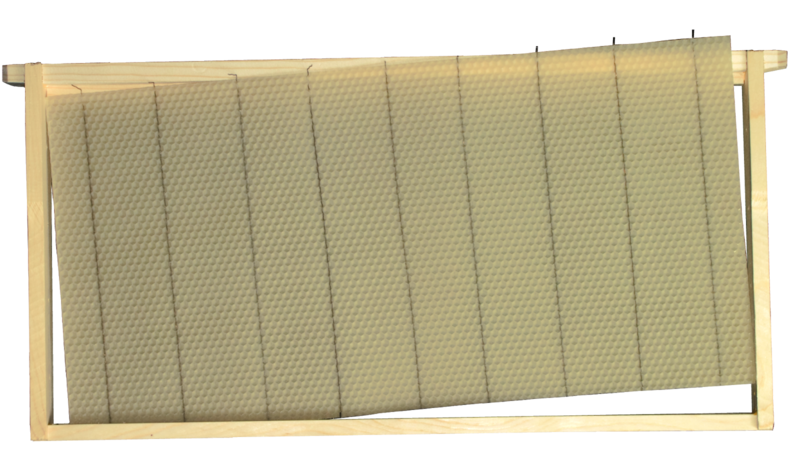 Full sections of drone cappings on a brood frame is a good signal that the queen was not properly mated. Do not be fooled! Some missing indicators of a healthy queen can be contributed to other events happening in the hive. When a hive is preparing to swarm the queen will slow her production, leaving a manageable brood nest for the remaining hive to care for. In addition, there will be an interruption in brood rearing as the virgin queen returns from her mating flight and settles into the hive. After new queens are introduced they may lay multiple eggs in the same cell and the occasional drone egg amongst the worker brood. After time she will settle down to a normal laying pattern. When to replace your queen. Replace the queen at the first signs of failing. A few weeks with a substandard queen in the spring can impact their health and strength going into winter. 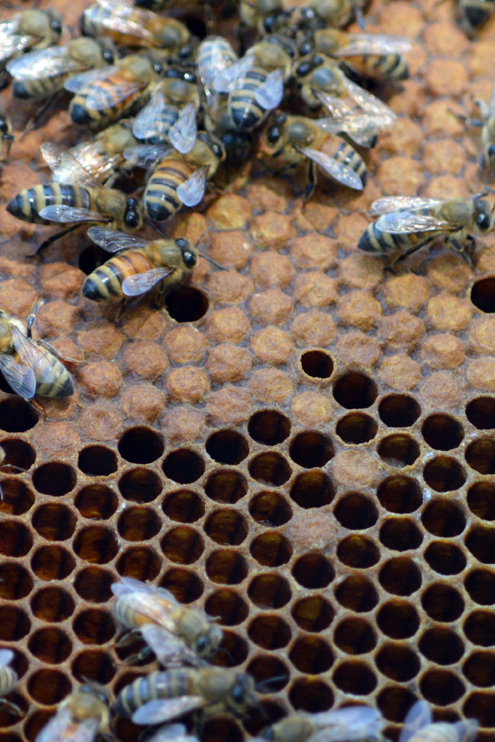 Some beekeepers will replace queens in colonies that are overly aggressive. Introducing a new queen with a gentle temperament will eradicate the defensive nature of the colony. Capped Queen Cell. It is common to find uncapped queen cells in any hive, but if you find a capped queen cell that means the hive is actively working to supersede the queen. How to replace the queen. DO NOT KILL THE CURRENT QUEEN UNTIL YOU HAVE YOUR NEW QUEEN IN HAND. The colony will be aware of the queen removal within a few hours and begin building supercedure cells. New queens are typically received in a queen cage that is sealed with candy and possibly a cork. Locate the existing queen and permanently remove her from the hive. Wait 24 hours before introducing the new queen and remove any queen cells found in the hive. Secure the new queen cage between the frames at the top of the brood area with a rubber band or other device to prevent from falling. The candy end needs to be facing up to prevent dead attending bees blocking the entrance and the screened facing open to the colony so the queens pheromone is dispersed throughout hive and other attending bees can care for her. DO NOT REMOVE THE CANDY! Never directly release a new queen into a colony. The risk of her not being accepted is too high. It may take up to a week but allow the colony to become acclimated to her pheromone and release her. A colony will be more acceptant of a new queen if there is a strong nectar flow; therefore, apply a feed to your hive. A failing queen will not improve and needs to be replaced. A proactive measure is to replace her every one to two years. Why you matter: Please take the survey today! It is not often that a solitary beekeeper, endeavoring to help nature, the environment and provide teachable moments to family, neighbors and coworkers, can make a difference, but in this case, you can. It is April and time to limber your fingers and take the Bee Informed Partnership’s National Loss and Management survey! Starting now and continuing until April 30th, your responses from this survey provide invaluable information that DIRECTLY contribute to garnering a clear picture of honey bee health throughout the country and helps guide best management practices. Thank you for all the beekeepers who, for 10 years now, have taken the time to complete the Colony Loss survey. Additional appreciation goes to those beekeepers who have provided data for our Management survey for the past 5 years. From YOU, we have determined year after year that treating for Varroa is one core actionable practice you can do to help your colony survive. Only 46% of beekeepers reported using a varroa mite product last year. From respondents to this survey, we see that those who DO treat, lose ~27% fewer colonies. That is marked reduction in losses! This is a trend that has remained consistent from every management survey we have conducted to date. To help us continue this effort, click the link below to take the National Colony Loss and Management Survey for the 2015-2016 season: Take the Survey Now! When you start out in beekeeping it can seem pretty daunting how many different setups and how many varieties of tools there are available. 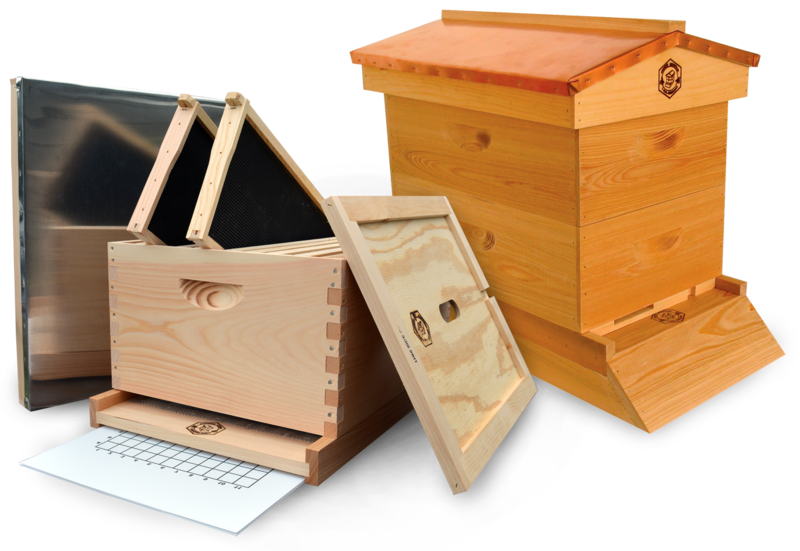 Here at Brushy Mountain Bee Farm we try to not only to provide a wide variety of tools for each beekeepers preference but also information to help better understand the beekeeping process. When it comes to beekeeping, of course the most important part are the bees, but you can’t have bees without a hive. There are many elements to a complete honey bee hive. Some parts are a necessity while others are beneficial but not required. HIVE TOP: A hive top is necessary to seal the hive and provide protection from the elements. 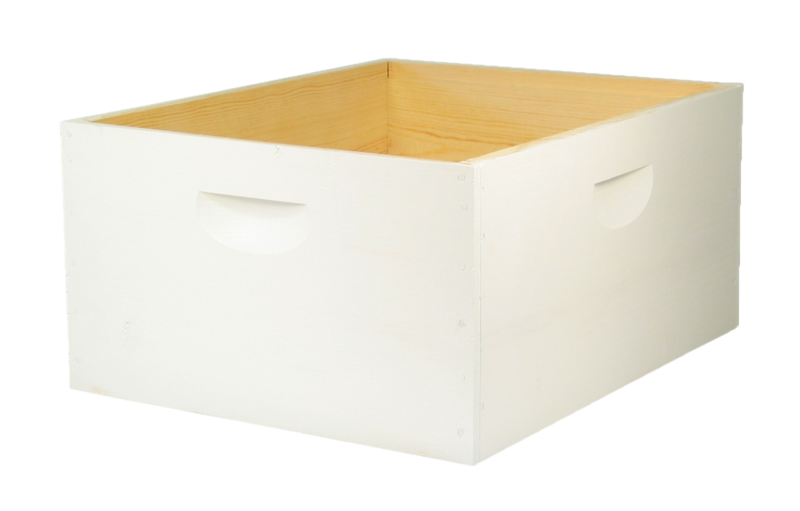 Two standard types of hive tops are the flat telescoping top and the A-Frame top. We manufacture our A-Frame top with a solid copper roof to make for an elegant garden piece but this design does have functionality as well. The weight of the Copper top prevents the hive top from blowing off during high winds, whereas, the telescoping top requires the beekeeper to place a weighted item on top to secure it down. The hive top has an overhang to prevent rain from seeping into the hive. INNER COVER: This is the barrier between your hive boxes and the hive top. The inner cover provides a flat ceiling to help control the bees buildup as well as make it easier to remove the hive top. Bees will secure the hive by "gluing" equipment together using propolis. Without the use of an inner cover, beekeepers would end up pulling apart their hive tops in order to inspect their hives. 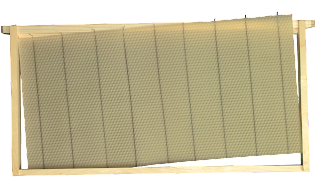 In addition to being a barrier, the inner cover creates dead air space for insulation against heat and cold and can also be used as an additional entrance via the hole in the center and grooved opening on the side. FRAMES and FOUNDATION: While everything else is the shell of the hive, the frames are where life happens. Everything a colony does, from raising brood to storing pollen, nectar and honey, happen within each frame. Each frame holds a thin sheet of foundation, a hexagonal pattern structure the bees use to store. Foundation can be made of pure beeswax sheets with wire support running through or plastic foundation with a thin layer of beeswax coating. 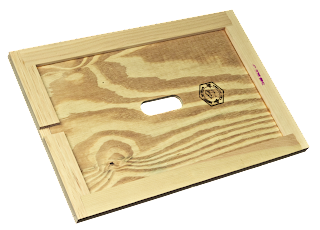 Beeswax foundation without ingrained wire support can also be used, but if you plan to use it, especially on larger frames, you may also want to consider support pins or support rods to help. Once the foundation begins to fill up it can get really heavy, if not supported, could collapse on itself. HONEY SUPER: This is where the fruits of you & your bee’s labor really show! Bees throughout the season are constantly producing honey to feed not just the present colony but build up surplus for whenever there’s a dearth and the bees are not able to forage for more resources. A colony will need upwards of 50-60 lbs. (roughly one full super) of honey in order to survive through the winter months in a temperate climate. The honey they have stored in abundance to the 50-60 lbs. can be harvested and extracted. Nothing tastes as good as honey from your own hive! The supplies used in a Honey Super are no different than what is used in the rest of the hive. They are called "honey supers" simply because they will be the designated supers to hold the excess honey. QUEEN EXCLUDER: In order to prevent the queen from moving up into the honey supers and laying eggs in your honey, beekeepers will place a queen excluder above the brood chamber. 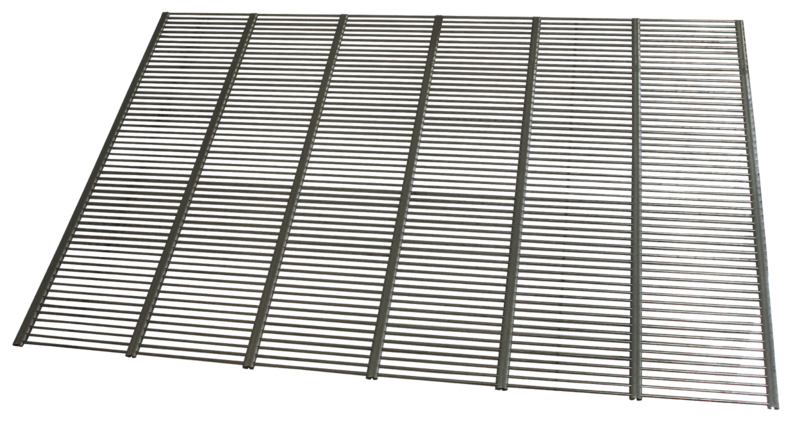 The precise grooves in these plastic or metal sheets are wide enough to allow worker bees to easily move throughout the hive and narrow enough to restrict the queen. Locate your queen before placing the excluder onto the hive. Ensure she is located below the excluder or your honey supers will quickly become the brood chamber.The queen excluder is a completely optional tool. You will find a lot of beekeepers divided on the importance of it. HIVE BODY: Your laying queen needs somewhere to lay her brood. That is where a hive body comes into play. 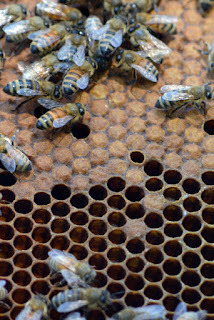 Hive bodies are used as brood chambers for the queen to lay her eggs and rearing of new bees. 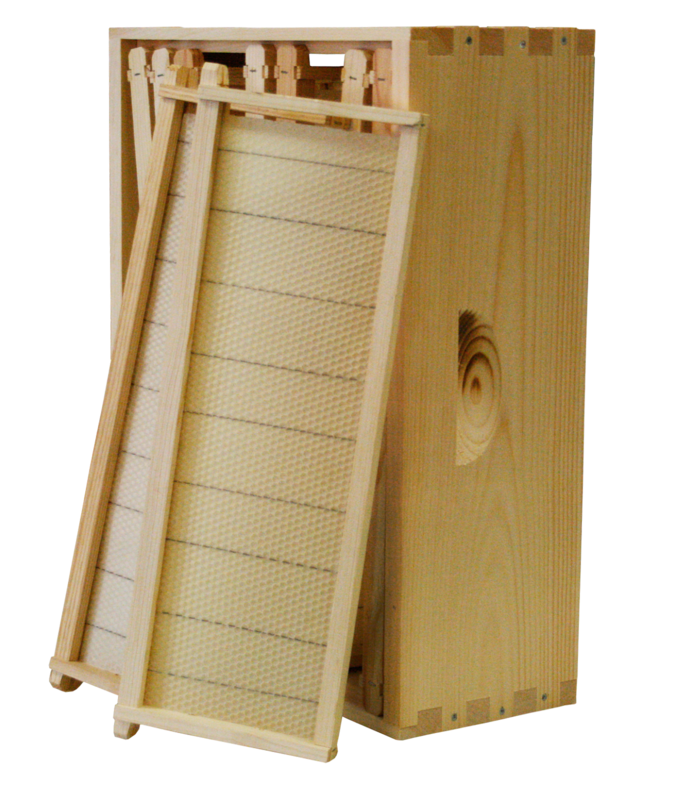 The hive body contains the frames the queen will build the brood chamber. Size-wise, deep hive boxes are most commonly used for brood chambers but there are several beekeepers (including many here at Brushy Mtn) who are using medium supers (same size as the honey supers) for both honey supers and hive bodies. Boxes used for brood chambers are always the lowest boxes of a hive. ENTRANCE REDUCER: When a hive is healthy and functioning at full force during the summer having plenty of entrance space is great, but when a hive is young or not functioning at its best, it will need a more manageable entrance to guard. With an entrance reducer you can manage the size of the entrance so when the hive is weak it has less of an area to defend from robbing bees and other smaller pests. 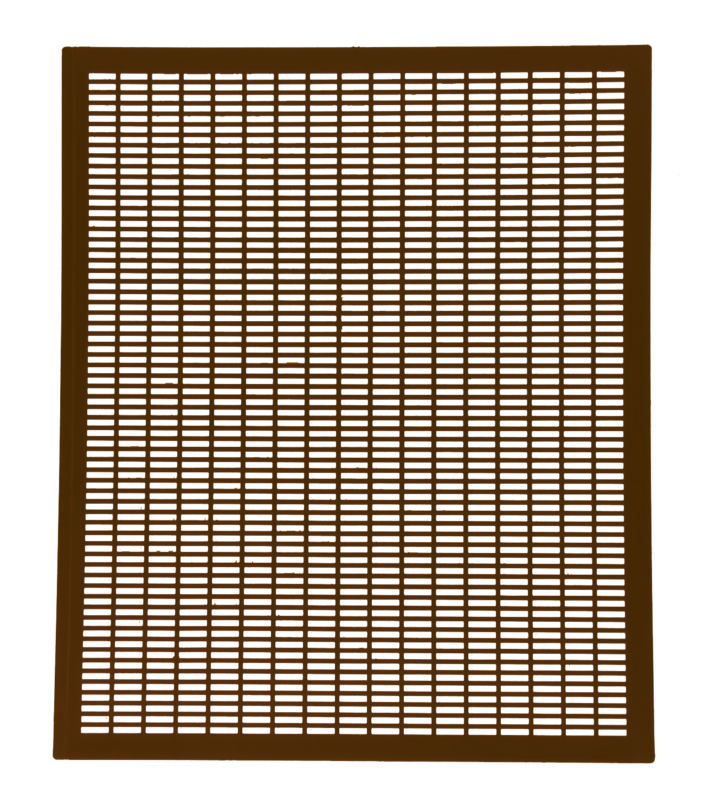 BOTTOM BOARD: The ground floor of your hive. A bottom board helps seal the hive from the bottom to avoid excess buildup as well as security from pest trying to get into the hive from below. For generations most bottom boards were solid wood but, in assisting with management of Varroa mites (bloodsucking ticks that leaves bees vulnerable to diseases) in a hive, screened bottom boards have become very popular. Not only do the screen help provide ventilation but it also allows for falling Varroa mites to be completely expelled from the hive. 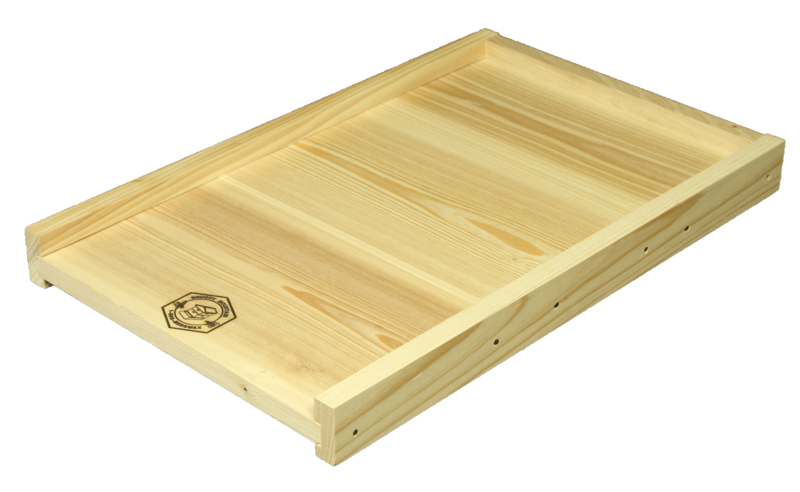 Screened bottom boards also come with a gridded corrugated sheet that you use occasionally to count how many Varroa mites fall out of the hive and decide if a mite treatment is needed to lower a Varroa infestation. HIVE STAND: The hive stand has three functions. One: It helps elevate the hive off the ground. To help protect it from pest and building moisture you will want your hive at least six inches off the ground. Two: It provides and extended landing platform for your bees so they have more room to maneuver in and out of the hive. Three: It makes your hive look pretty. The hive stand is not a necessity but elevating your hive at least six inches off the ground can help protect your hive. 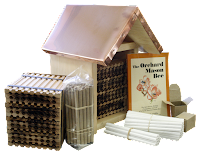 Learn more about the beekeeping supplies. Learn more about the difference between 8 & 10 Frame hives. 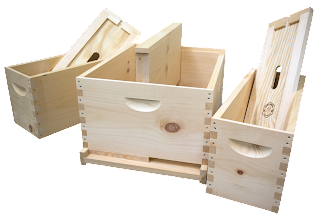 There are several things to consider when planning to begin beekeeping, such as, the size hive you will want to use. The size you choose is directly relates to the number of frames each box holds. The two sizes to choose from are: 8 Frame or 10 Frame. There are pros and cons to each hive sizes and it will benefit you to understand them before making the investment. Generations of beekeepers have considered 10 frame hives the "traditional" hive. The biggest advantage of 10 frame hives is that each hive box can hold larger quantities of honey and bees per box. This is not to say the size of your colony will be larger or that you will be able to harvest more honey, rather, each box will be able to hold more. This can be beneficial as your colony grows in population. You are not continuously adding The downside is when your honey super is full of honey they can weigh up to 80 lbs. This is very strenuous work and if you have trouble lifting heavy items you may have trouble managing a 10 frame hives. Have you ever noticed feral honey bees? They tend to build their hives in tall narrow locations such as hollowed tree trunks. They follow this same mindset when working in a hive; build up rather than build out. With the 10 frame hive, just before you place another hive body/super onto the hive, you may need to rotate the outside frames in so the bees will build on all the frames. 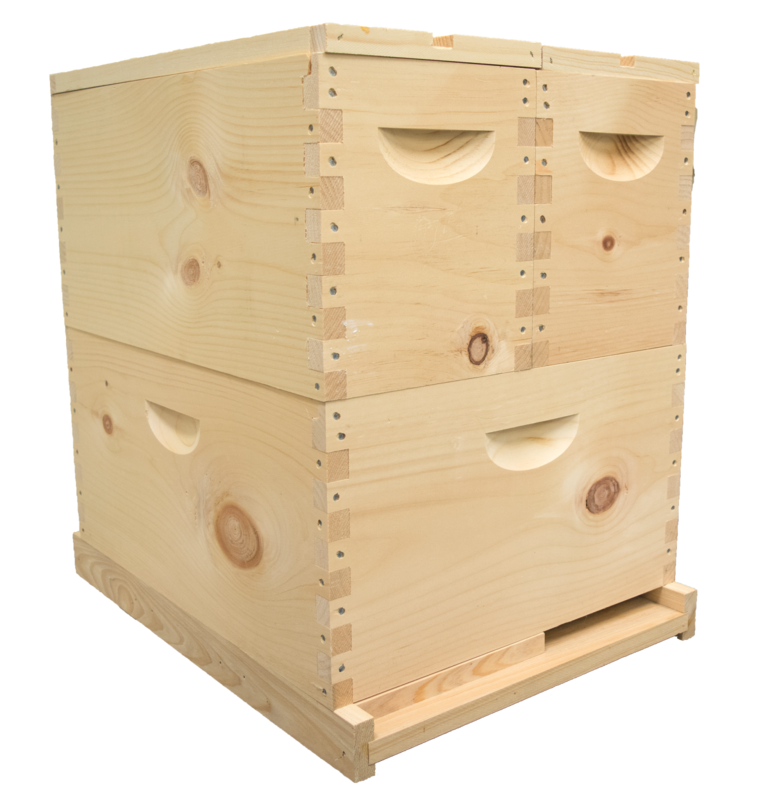 8 frame hives have been used for over 100 years and have started to grow in popularity in recent years because of their efficiency. We use 8 frame equipment for our hives at Brushy Mountain Bee Farm. A full 8 Frame honey super can still weigh up to 60 lbs, but the hive boxes are much easier to manage. The center of gravity is closer to the body with 8 Frame hives and that makes them easier to maneuver. 8 frame hives mirrors a honey bee colony's natural building style with its narrow chamber. The colony can easily outgrow the box and requires close observation to know when to add the next super for them to move in to. Even though 8 and 10 Frame hives have their differences, in the end they both do the exact same thing. It all comes down to whatever size you feel most comfortable using. The hive size doesn't make a significance in the size of the colony or the amount of honey it will store. 10 frame hives have been a tried-and-true size used by countless beekeepers throughout the years, but 8 frame equipment has become a more economical and can be easier to manage. Just know that you cannot use 8 and 10 frame hive components on the same hive. You can have multiple hives each their own size, but you can not mix sizes on one hive. Many beekeepers know the benefit their girls play in pollinating their gardens,but your foraging bees are not the only bees that are there to collect pollen. There are a range of native, solitary bees that are just as important as honey bees when it comes to pollination, plus, they require less maintenance and are not as aggressive. So, if you want to invest solely into pollinating your gardens, is it better to keep honey bees or should you rely on the native bee for pollination? Each has their own benefits. The solitary bees, such as the Mason, are more efficient pollinators than the honey bee if you are comparing bee to bee. Honey bees are attracted to nectar producing flowers and as they travel from flower to flower they indirectly help in pollination. Their main interest is harvesting the sweet nectar these flowers produce. Mason bees on the other hand are pollen collectors. They will gather pollen to take back to their nests. Once the female Mason bee is released she will begin building her nest and collecting pollen to lay with each egg for the duration of her four to six week life span. Mason bees are solitary and do not require any management until the eggs are harvested, whereas, Honey bee hives require close inspection and monitoring. 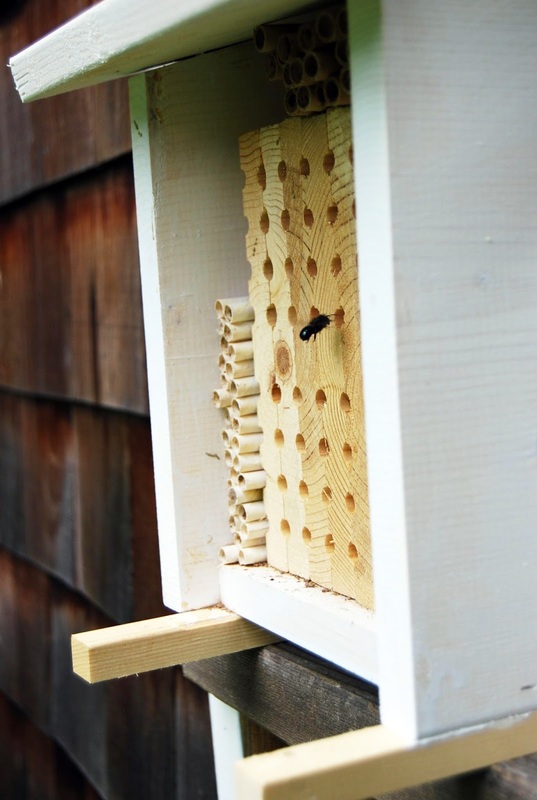 Mason bees are less aggressive and the startup cost is very minimal. They live independently and are less susceptible to diseases and pests. The benefit of honey bees are their numbers. Honey bee colonies will consist of tens of thousands of bees and in turn they have a larger field force to help with pollination, making them better pollinators overall. As soon as they are finished with one crop, they can be transported to the next, impacting a larger demographic of pollinating plants. Mason bees will transition to where pollen exists if their current location lacks what is needed, whereas, honey bee's foraging range is larger so they can bring in the resources the colony needs. There is no guarantee the Mason Bee will return to the nesting site to lay for the following year. Honey bees will forage for nectar and pollen after breaking cluster in spring and will continue until temperatures return to the 50s in the fall. Mason bees have a 4-6 week window for pollinating, after which, the female will seal in the cocoons to develop over winter. While honey bees continue to play a major role in commercial pollination, both honey bees and mason bees are perfect for backyard gardeners. The importance of bees goes beyond our own farms and gardens. Their reach helps maintain a diversity of ecosystems with many wild plants relying on their pollination to produce seeds, fruits or nuts. These plants form the foundation of the food chain for many birds and other wildlife. Bees are a necessity that we cannot live without. If you are after pollination in your garden, the answer is to utilize both Mason and Honey Bees.